May 17-23 is Hemp History Week, a joint project of Vote Hemp and the Hemp Industries Association. On May 15, Melissa Miles, Organizer of the Eastern Pennsylvania Permaculture Guild, will be partnering with Kimberton Whole Foods to host a Hemp History Week Town Hall Meeting. 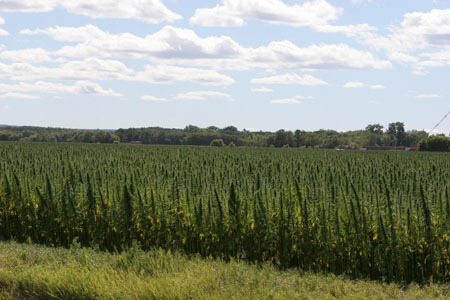 The meeting will include a presentation on the history of hemp farming in Pennsylvania up until its prohibition, as well as a discussion of the many uses for hemp and its economic potential as a low-input, sustainable crop. ﻿It's strange that a once mandatory crop for farmers is now illegal. Goodness, George Washington and Thomas Jefferson even grew their own hemp! Through Hemp History Week, Vote Hemp is hoping to accumulate at least 50,000 signed post cards urging President Barack Obama and Attorney General Eric Holder to allow farmers to grow crops of versatile and profitable industrial hemp. Click here to find out how you can be involved or to register as a grassroots community organizer. The Hemp History Week Town Hall Meeting will take place May 15, 2:30-3:30 p.m. in the Kimberton Whole Foods Cafe.